1 x Yoga ball. increase blood circulation, strengthen heart and lung function! suitable for sisters with fat belly, thick arms and legs! can keep your spine straight, thus improving your hump-back issue! Specification -Black Peanut Shaped Massage Ball. Peanut ball weight : 316g. The massage ball allows you to reach the deep areas of tight tissue with the use of applied pressure or your own body weight. Peanut massage ball is for effective muscle fascia trigger point release (Trigger point referring to an area that is causing stiffness/discomfort). 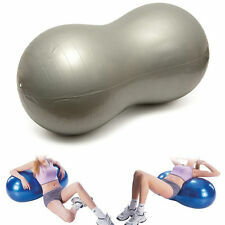 1x Peanut Shaped Massage Ball. Peanut ball weight : 316g. It is not easy to deform, not sticky, and light in weight. Massage the whole body to relieve fatigue. Massage 1 set(3 pieces). If you encounter any trouble. 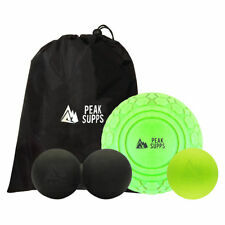 Massage Ball Stress Reflexology Myofasical Ball Exercise Ball Lacrosse Ball . (1) Peanut massage ball: massage in a large area to relax muscles, promote blood circulation, and quickly awaken body vitality. 2) Glossy yoga ball: massage in a partial area to relax muscles, promote blood circulation, and quickly awaken body vitality. This fitness yoga exercise ball can help you achieve muscle and tension release for all parts of the body. 1 x Yoga Exercise Ball. Features Peanut Shape. This fitness exercise ball can be enjoyed and used by anyone, from children to the elderly and the disabled. It is not easy to deform, not sticky, and light in weight. Massage the whole body to relieve fatigue. Massage 1 set(3 pieces). Features: 100% Brand new and high quality! This fitness yoga exercise ball can help you achieve muscle and tension release for all parts of the body The surface also promotes sensory stimulation and is perfect for body dexterity exercises This yoga exercise ball is made of durable material for long time use Compact design can be used at work, play, home, or sports This fitness exercise ball can be enjoyed and used by anyone, from children to the elderly and the disabled Specifications: Dimensions: 90 x 45cm (L x W) Max Bearing Weight: 7054.79 oz / 200000g Material: PVC Package Includes:. (2) Glossy yoga ball: massage in a partial area to relax muscles, promote blood circulation, and quickly awaken body vitality. 1) Peanut massage ball: massage in a large area to relax muscles, promote blood circulation, and quickly awaken body vitality. Both types of ball (Sphere and Peanut) are effective at releasing neck, shoulders, back, chest, forearms, buttocks, hamstrings and calves, ankles and plantar fascia. The massage ball allows you to reach the deep areas of tight tissue with the use of applied pressure or your own body weight. 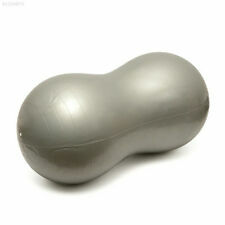 Our Roller Exercise Massager Balls are lightweight and convenient. ✓ Decreases the pain of plantar fasciitis and flat feet. Acupressure porcupine sensory balls with superior materials, non-toxic safe material, made of high-qualityPVC that are no harm to your skin and durable enough to help you rid of muscle pain. Massage ball is for effective muscle trigger point release (Trigger point referring to an area that is causing stiffness/discomfort). Our Komodo massage ball allows you to work on tight muscle tissues, muscular knots and stiff joints. Type Balance. MPN Does not apply. Size: 45cm. Overall size. (inflated) about 90 x 45cm /50cm. 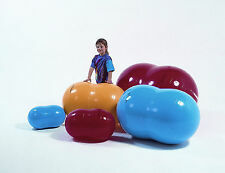 The peanut ball has a unique, saddle shaped, seat that provides increased stability, as it will only roll in one direction. Peanut ball set includes convenient foot pump. Your Pilates sessions. Start easily with this more accessible shape. DOMYOS Pilates Anti-Burst Oval Peanut-Shaped Swiss Ball - Blue. Burst resistance: If it gets punctured, don't worry - it goes down slowly. Specification -Black Peanut Shaped Massage Ball. The massage ball allows you to reach the deep areas of tight tissue with the use of applied pressure or your own body weight. Peanut ball weight : 316g.